This picture shows some of the new artwork that I have been working on. I wanted to do typical Zelda perspective walls earlier but I knew it would take a lot of time to get right. Now I have that time. So, I’ve decided I’m going to keep working on DiveDive for the time being. I was surprised at how much I accomplished within the limitations of the 7 day challenge, but I still think the game needs a lot of work. There were a lot of bugs in that first release, and some serious balance issues. I have tried to fix the major problems so that I can start moving forward with adding more variety to the base game. The thing with rogue-likes as a genre, is that they are designed to be as replayable as possible. Sadly DiveDive is pretty limited in this regard so far, feeling much more like a linear and finite experience. Click here to download the new build. This has been a great week, but also a rough week. I stayed up 22 hours yesterday, and only slept 3. It’s been exhilarating, but also extremely challenging. It’s been a powerful and emotional moment in my life. I feel like I’ve leveled up as a designer, and I want to keep this momentum going. This week has reinvigorated my understanding and faith that THIS is what I was born to do. Unlike probably some of the 7DRL participants, I work a day job 40 hours a week. Being too conscious of this has always held me back from engaging with most of these similar challenges in the past, but something changed this time. The challenge coincided nicely with my reading of Anna Anthropy’s Rise of the Videogame Zinesters, which helped solidify some of the thoughts which were brewing in my mind from being unable to work on Duet effectively. The book finally convinced me that the only road to me being a more productive designer is to start focusing on finishing very small scope things, and making that a priority above trying to polish them to perfection. Don’t think about it, just make a game! I think you only get good at things by doing them, and I’ve gotten awfully good at languishing in the middle of a gigantic multi-year project with no clear path to completing the game. It is so demotivating to work on a project for 3 years and still not have something you are really proud to show to people. But DiveDive is that, and I only spent a week on it! I have a tendency to be too detail-oriented when working on a project. I tweak the tiniest details before I finish the broad strokes of the game. It is SO much better to make a complete experience as early as possible and then polish afterwards. I have heard an analogy with sketching from Derek Yu: The best way to get better at sketching is to put a time limit on it. Try to capture the subject in as few strokes as possible. Limit yourself to 10 seconds, then tyr moving up to 30 seconds, then a minute. And finally, remove the time limit all together. It’s so important to not start your creative works with the details. Those don’t matter at all if you never finish the big things. My brother played an earlier version of Dive Dive this week and what did he point out? There’s no boss at the end. 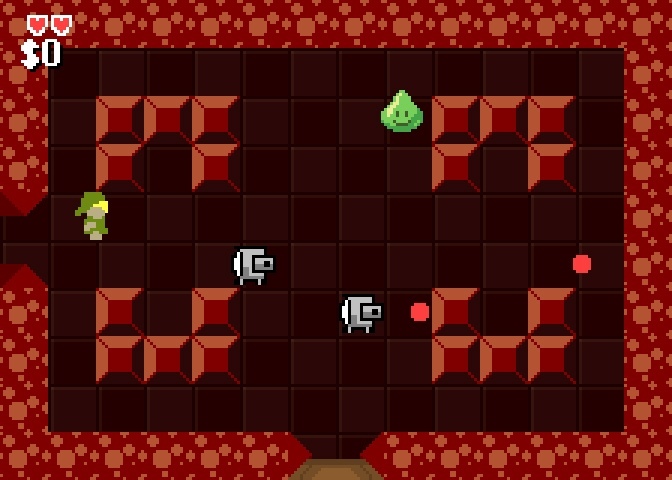 He didn’t even notice there were only two enemies, or that the slimes didn’t behave the way I wanted them to, or that the sprites vary wildly in color palette and rendering style. As a creator, you are the most intimately familiar person with your creation. All you will see is the flaws, but don’t get caught up on polishing the slash animation for a whole day. Try to do as little as possible to get all of your points across. 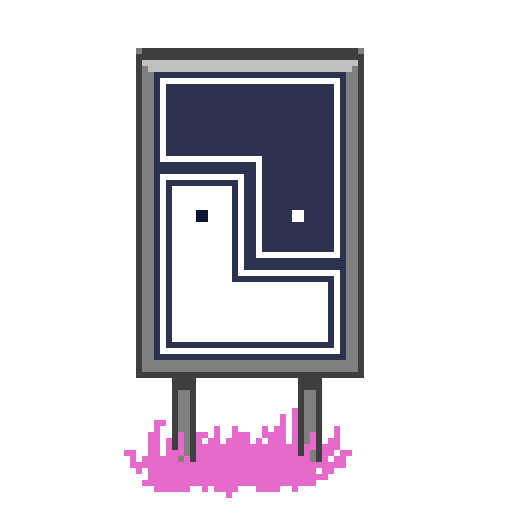 The audience won’t notice that that one pixel doesn’t have the perfect color, but they will notice an experience which didn’t even have an ending! 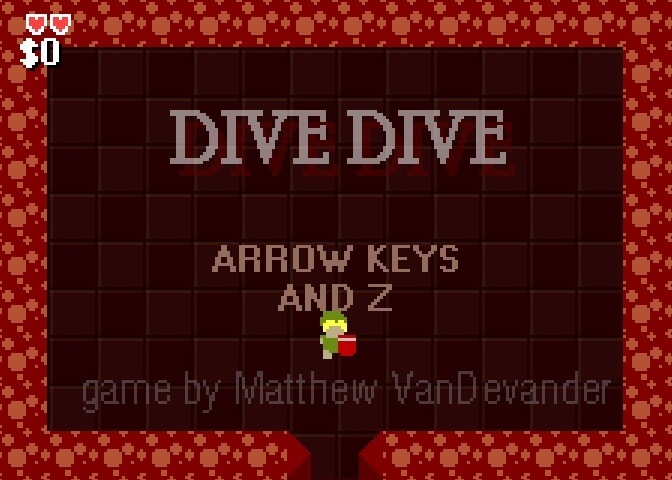 I didn’t get everything into DiveDive that I hoped to, but I got way more done than I expected. I think this proves to me something I already thought I knew, that you really can build a functional prototype of any idea in a week. But, before I thought that meant it was “kinda working” within a week, but it actually means that by the end of the week you can have something that is really working because it either shows the potential of the idea or doesn’t. DiveDive has heaps of potential, I could work on it for years if I want, just adding more and more features and secrets, tweaking and polishing the art, writing my own music rather than using licensed tracks…but I have reached a point within a week where it is polished enough to not embarrass me and I believe it has some great ideas in it already, while certainly firing the imagination about how much more could be done. It’s just impossible for me to overstate how satisfying it is to actually have something that feels like a complete experience so quickly, so that I can show it and feel confident if I choose not to ever work on it again. The funny thing about games (and art in general), is that you really can work on a project for as long as you like. But there eventually comes a time when you need to put the pencil down, and the sooner you can feel safe about doing that, the better. A MINOR ADDENDUM: So, the game was completely finished yesterday and I uploaded it only to find out from the first player that it was totally bugged. In the game, you start with no money, but I had put in a hack to give you $500 so I could test things. I unfortunately, in my sleepprogramming state had forgotten to remove the hack before I released. Let the lesson be this: ALWAYS BE SURE TO TAKE OUT YOUR HACKS. Uses music by Kevin MacLeod, and a sound effect by “RA The Sun God.” Both are used under the Creative Commons Attribution 3.0 License. So, no new build tonight because I want it to be “complete” before anyone sees the ending. Trust me though, it is amazing. I have never been as productive in my life as I have been this week. I slept 5 hours last night because I couldn’t for the excitement to work. Just wanted everybody to know I’m pretty proud of this little game, and I want you to see it in the best state I can get it over the next 24 hours. I may or may not keep posting these updated builds daily, but here is a new one for today. Njoy! A whole roguelike in only seven days! So, theres this thing called Seven Day Rogue-like. (or 7DRL for short) It’s a friendly challenge held once a year to produce a game in the genre. 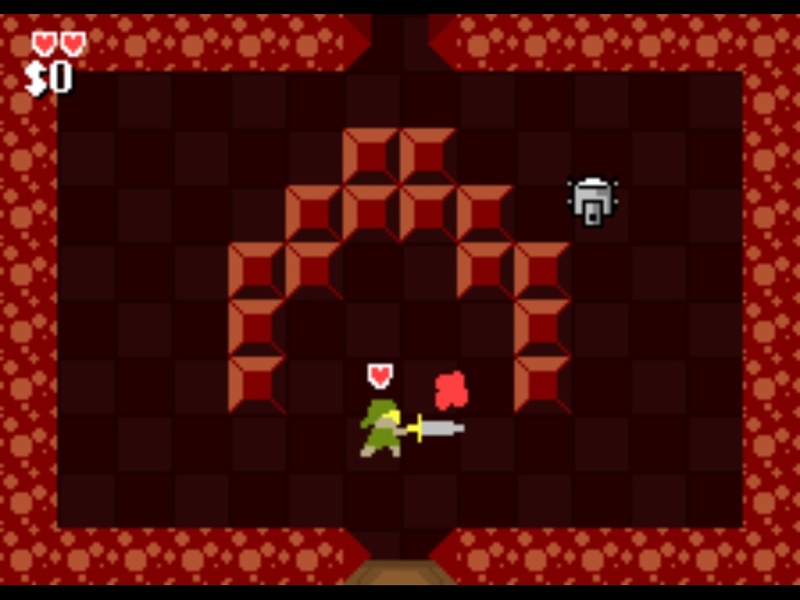 I won’t go too much into what a roguelike is, as that can easily be satisfied with a Google search, but I will say that I am working on an entry called “Super Legend of DiveDive” (Dumb name, thats what you get when you name something before you start working on it.) 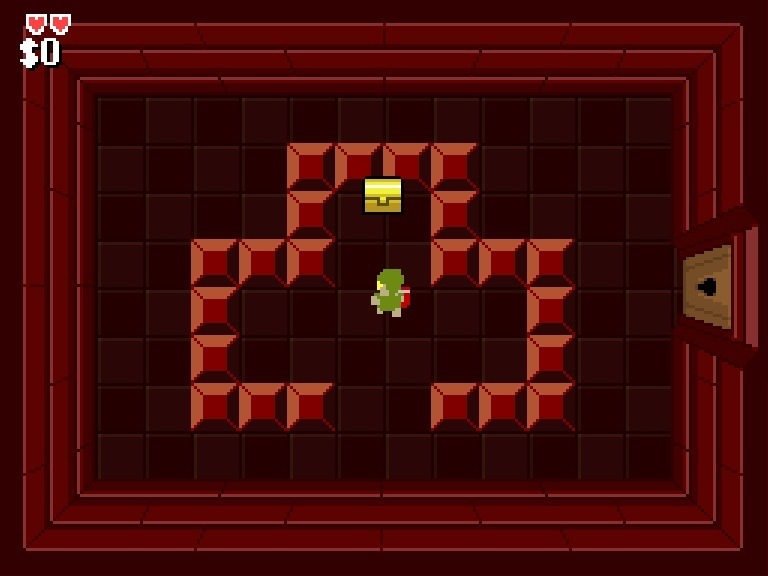 Its basically a roguelike modeled after the dungeons from Zelda 1. “But wait,” you say, “Isn’t Binding of Isaac already a game?” Why yes, you irritatingly attentive little boy or girl. But this game is EXACTLY LIKE ZELDA! Just look at this screenshot up there! Features music by Kevin MacLeod, used under Creative Commons license.